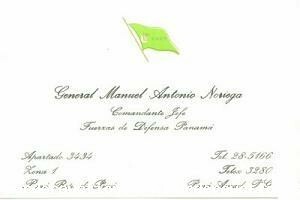 Following up on an earlier post on Saddam's sword and war souvenirs, there is only about 24 hours remaining in an auction on MurderAuction.com for a "General Manuel Noriega original business card in great condition - This is not a copy." Minimum bid is $49.99. An Army policy announced during the Panamanian action allowed soldiers to take souvenirs as long as they were not weapons, drugs or anything that might have been used as evidence in criminal proceedings. This did not escape the attention of Noriega's lawyers who had already been trying to ensure that the Government was preserving the documents seized in Panama for possible use in his defense to criminal charges in Miami. On February 2, 1990, Noriega's lawyers filed this "Motion for Inventory and Return of Stolen Property" arguing that "soldiers ransacked General Noriega's residence and stole numerous articles of personal property belonging to General Noriega," that "one Joel Peterson, brother of Sergeant Mark Peterson, is selling stolen business cards of General Noriega in Southern California," and that this was apparently permitted by U.S. Army policy. "Conduct of this nature, by the United States Army," the motion continued, "is reminiscent of ancient times when Attila the Hun and barbarians sacked and burned cities and later divvied up the booty among themselves." The government's response in opposition to the motion denied that any property had been "stolen" and noted that the only specific item mentioned in Noriega's motion was "business cards, items which by their nature are meant to be distributed" and that "it is difficult to image what if any evidentiary value applies to the business cards." In a classic U.S. government argument, the response stated that the U.S. "submits that to the best of its knowledge, none of defendant's property has been stolen" (emphasis mine) and that "[i]nsofar as any items may have been removed from those locations with the government's knowledge, they were removed in compliance with applicable military regulations and directives" without ever addressing whether such regulations or directives, as Sgt. Peterson and the original motion had claimed, allowed individual soldiers to take Gen. Noriega's property as war souvenirs. More pressing issues soon overtook the Noriega case and the motion was later denied by Magistrate Judge Turnoff without comment in July 1990. With time, however, the allegations in the motion have found additional factual support, not only in the ongoing auction, but in numerous stories over the years. As just one example, see this account involving not only a business card and stationary, but even a "reproduction of an ancient map of the world produced on fabric" that a soldier "found in Noriega's office while his unit emptied the Panamanian leaders files" which later had "an honored spot on the wall" of that soldier's "Englewood home." Another one of Noriega's business cards ended up, perhaps more appropriately, in the Business Card Archives founded in Iowa by Walter Day.